Display: 3 Digits 0.56 RED 7 Segment LED for Humidity. Cleanrooms Class 1 00 000 [ISO 8] to Class 10 [ISO 4], the all in one turnkey projects for various application. Project management, Design, Installation to Testing & Validation. Conversion of existing facilities to meet the standards of GMP. Biosafe Healthcare Systems Pvt. Ltd.
We are recognized among one of the noteworthy manufacturer and supplier of a broad assortment of Pharmaceutical Clean Rooms. Our product range is developed using optimum quality components and other material at our well established fabrication unit. The De-Dusting Booth system is used to remove the loose particles/dust present on the receiving materials, which will be brought into the warehousing area before they are transferred into the quarantine area. Dimensions : As per drawings enclosed. Pre Filter : Pre Filter with Micro Glass Fibre Media of EU - 4 Rating. 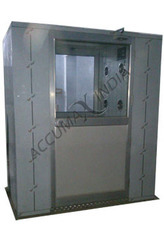 The Laminar Airflow Unit manufactured by us is delivered relying on various types of process and types. Available in SS 304 make, our units are offered with various optional accessories including VFD, digital DP alarms, velocity sensors and vinyl curtains. Our units are used for capping areas and flame proof areas. Chrisleen Cleanroom Projects Pvt. Ltd.